In a crass yet frank admission, Bayer CEO Marijn Dekkers said the company’s new cancer drug, Nexavar, is not “for Indians,” but “for western patients who can afford it.” The statement came in the wake in a recent ruling by an Indian court that certain life-saving drugs could be produced and distributed at 97% of the brand-name price. Such apologism for Bayer unwittingly implicates the wider system: ‘in order to produce life-saving drugs, we need to restrict access via pricing measures, dooming many to unnecessary suffering and death, so that we can make a profit and do it again.’ Of course, ‘everyone’ will ‘eventually’ receive hypothetical benefits over the long-run. What will they promise next? Flying cars and elixirs to restore youth? Following the war Bayer joined with other chemical manufacturing firms to form Farben, the largest company in Germany at the time and the largest contributor to Hitler’s election campaign. During the Second World War, Farben used slave labor in many of it factories and mines. Working with the Nazi regime, Farben owned the patent to Zyklon B, the cyanide-based gas used to murder over a million people in concentration camps throughout occupied Europe, which it produced without any odorant. In 1946, the Nuremburg Tribunal concluded that without Farben, WWII would not have been possible. Only 13 of the 24 Farben board members indicted on crimes against humanity were sentenced to prison, and those who did received sentences which were, in the words of the prosecutors, “light enough to please a chicken thief.” Additionally, many of the Nazi-supporting executives and managers returned to the “new” companies that Farben’s assets were divided into in 1952. 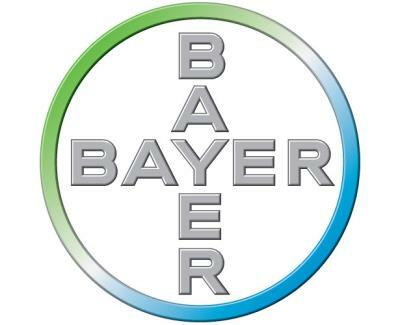 Today, Bayer is a huge conglomerate with three primary divisions: Bayer HealthCare, which makes drugs and medical equipment; Bayer MaterialScience, which produces polymers and plastics; and Bayer CropScience, which produces pairings of GM crops and agricultural chemicals. 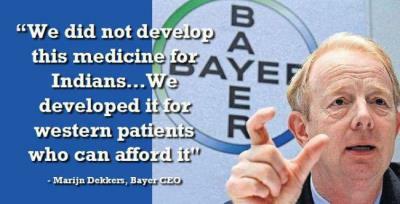 Essentially, Bayer is three large companies, two of which produce or use materials which cause medical conditions like cancer, one which produces cures for medical conditions like cancer – but only for people who can can afford it. India is not the only country attempting to produce generic versions of patented drugs at a significantly lower cost. South Africa recently caused a row after a similar court ruling allowing for the low-cost local manufacturing and distribution of internationally-patented drugs. In both cases, western capital has threatened punitive actions and even more restricted access to new drugs in the future. The controversy of local manufacturing of drugs highlights some of the contours of global contradictions. In this case, the bourgeoisie of a small handful of ascendant Third World countries are feeling more at liberty to challenge the economic hegemony of trilateral imperialism. Western imperialism, for its part, is feeling evermore threatened and determined to maintain its hegemony. Economically speaking, patents and intellectual property is a type of monopoly capital. When joined with other forms of finance capital, i.e., insurance companies which typically pay the bulk of expensive treatments for those privileged enough to be covered, such monopoly capital allows for the circulation and concentration of capital in the core at the expense of the periphery. Hence, not only do intellectual property rights necessarily restrict access to life-saving medicine for those who cannot afford it, they are part of a system which creates the very conditions whereby the world’s masses are typically poor in the first place. It is clear that a real solution to global health will not found within the modern capitalist-imperialist system. After all, under capitalism if pharmaceutical companies can not restrict access to their drugs to secure a profit, they have no purpose to exist and would actually fail as a company. The very business model of the drug companies is predicated within a larger system in which a majority of people will not be able to afford their products or services. A real solution must be sought through a new governing economic principle: democratically and rationally producing and distributing the satisfaction of wants and needs. Such an economic system can only be instituted through revolution: the overthrow of capital-imperialist productive and social relations – intellectual property rights and all – and the economic and political ascendancy of the world’s exploited and oppressed masses.